I’m a nice, easy-going type of person. I respect other people as long as they treat me respectfully in return. I don’t yell at phone solicitors or get into arguments with a company’s employees when things don’t go my way. I always try to be polite and cordial to people I come into contact with. Today, all of that changed. I went to a fast-food restaurant this morning for breakfast. Yes, I know, I should be dieting so I don’t rip any more of my pants, but today I forsook that diet so I could have a mouth-watering, calorie-infested but oh-so-delicious breakfast. 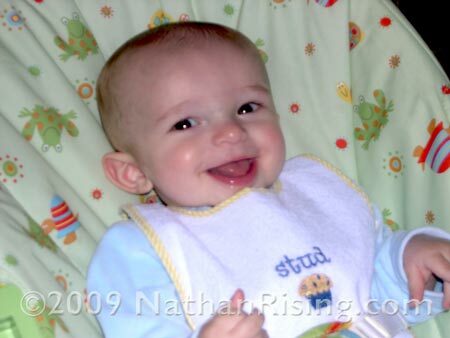 I was in a fantastic mood… Nathan fed well and was wonderfully happy. My husband was working from home. The weather was mild and lovely. It was all butterflies and unicorns around here. You get the picture. So I get to this fast food restaurant and order our breakfast… one for my husband and one for me. Everything went smoothly. The guy at the window, however, was in a blatantly bad mood. I smiled politely but he merely scowled in return. Ok, that’s fine… I understand (totally understand) what it’s like to be in a bad mood while you’re working. So I take my meal and smiled in the hopes that smiling really is contagious. (Paul later told me that this guy has been working at this particular restaurant for a while, and he never smiles.) I drive a couple feet up from the window and check my bag. I was missing one of my orders. No big deal, though. It happens all the time. So I put my car in reverse and backed up to the partially opened window. And I waited. The day that was once filled with butterflies and unicorns was now only filled with butterflies. The good-day unicorns all died when my mood started to turn sour. It’s not that I had to wait that soured my mood- it’s that I was being blatantly ignored. Every single one of the workers that were in my eyesight looked over at the window when they saw me back up my car. At first I thought they were just busy and would get to me as soon as they could. But I continued to wait and none of them looked over a second time. Not one. Finally, one of the workers sauntered over to the window. She looked right at me, so I smiled. However, instead of asking me if I needed help (which was fairly obvious considering I put my car in reverse and backed up to the window), she started restocking the cups at the drink machine. I even yelled hello? at the window since it was open. I was being brazenly and unabashedly ignored, and that pissed me off. Royally, profoundly pissed me off. Me, who doesn’t yell at phone solicitors or get into arguments with a company’s employees when things don’t go my way. So I became furious and honked laid on my horn until every body in the kitchen stopped what they were doing and looked my way. Finally. I got some attention. The guy who initially handed me my order slowly sauntered to the window. I explained that my order was missing an item, and he turned around, grabbed the item out from under the warmer, and handed it to me. How easy was that? Seriously. I was still pretty irate when I finally arrived back home. I was hungry, my blood was still boiling, and our food had started to cool down. And then I saw this little guy with smile on his face, and I couldn’t be mad any longer. The unicorns all came back to life and my sour mood was lifted for the day. But I will probably not be going to that particular restaurant for a while.